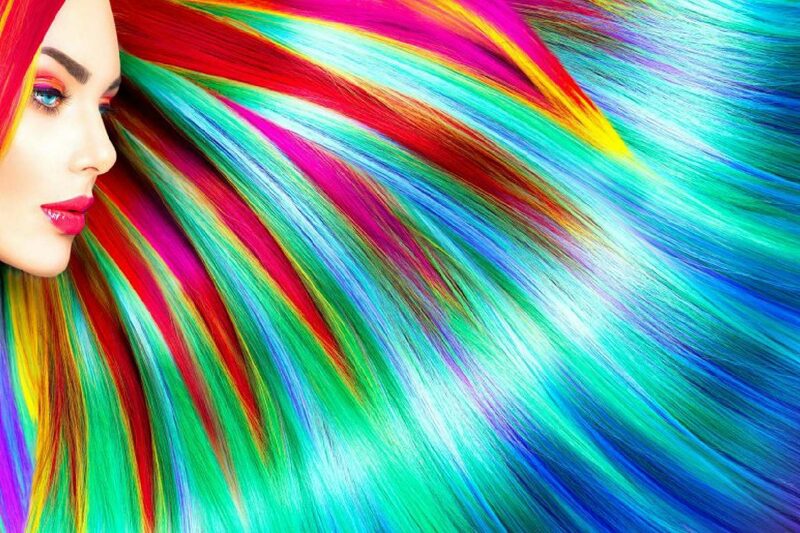 There are many factors that affect a picture of newly highlighted or colored hair. Our stylists share some of their insights on the expectations vs what the reality is when it comes to outcome. Lighting can affect the outcome of a picture. The picture on the left was taken inside the salon and the one on the right by the front receptionist area. The only difference is salon lights vs natural lighting. This is stylist Amanda’s highlights and the actual color is the warm, golden blonde highlights on the left. The technique used was Balayage and was completed in one session. 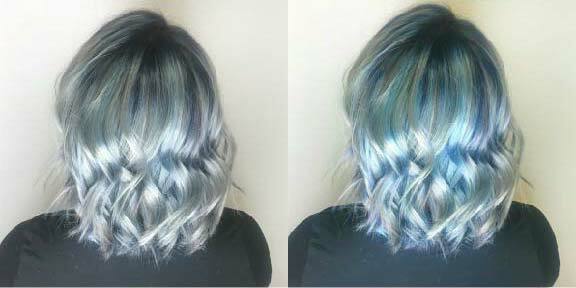 Two separate highlight sessions would be needed to achieve the cool results on the right. Brazilian Bonder would be added to keep the integrity of the hair and a toner to get the cool color. At home maintenance would also be important to keep the results. Blondor shampoo should be used every other time you shampoo to keep your toner fresh, and Cashmere Shampoo and Moxie Conditioner used to keep your hair healthy. There are so many apps and programs on the market that can alter the reality of a photo. The photo above is changed from highlighted Ombre to an Ombre with fun colors. 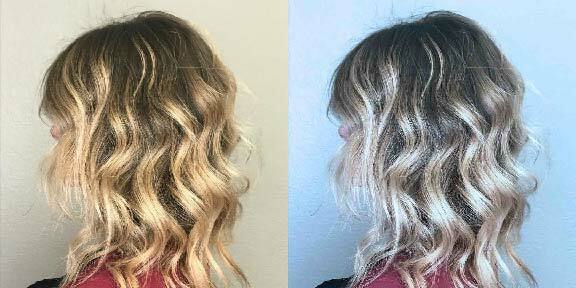 Stylist Mayce says it’s not impossible to get the look on the right using an Ombre technique and toner. 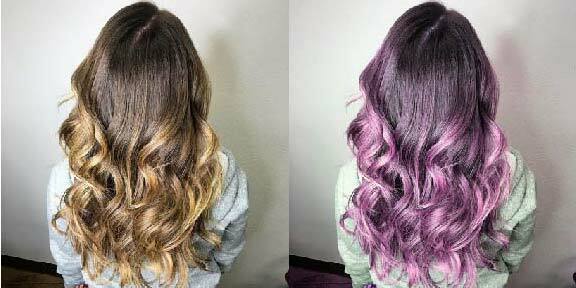 Something to keep in mind is because the fun colors are not permanent color this would fade from a purplish/pink to a pastel pink rather quickly. The camera used makes a big difference, too. The picture on the left is the actual result of highlights and toning and taken with an iPhone cell phone camera. The one on the right is taken with the same lighting, but with a Samsung phone camera. Kristin states that if the picture on the right was presented, it would be quite tricky to duplicate since it’s not an accurate representation of the actual color. These days there are so many different ways a picture can be altered. Some of these ways are unintentional and some on purpose to make something look like what it isn’t. Filters are probably the biggest culprit. So the next time you’re looking for a new do, come in and talk to a stylist for a consultation – it’s complimentary!